FALLS CHURCH, Va. – Waverly’s of suburban Washington, D.C., will offer connoisseurs 450 lots of rare books, maps, atlases and ephemera in a well-rounded November 21st catalog auction. Many themes and categories are featured, and key selections include an 1865 note signed by Abraham Lincoln, The Complete Works of Edgar Allan Poe(1902, 10 vol. ), and a “censored” Civil War-era map showing the locations of 20 forts around the nation’s capital. 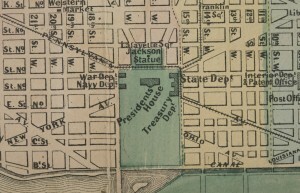 Section of 1862 topographical map of ‘Original District of Columbia and Environs’ showing street grids and important landmarks, including ‘Presidents House.’ Est. $4,000-$6,000. The 1862 topographical map of the “Original District of Columbia and Environs” was created by G. Arnold C.E. and published by G. Woolworth Colton of New York City. The highly detailed map shows not only the region’s natural features, both Washington City and Alexandria’s street grids and railroads, but also the location of more than 20 Union forts, marked in red. “It was considered a threat to security for these forts to be identified,” said Monika Schiavo, director of sales and marketing at Waverly Rare Books. “The map came to the attention of the War Department after it was offered for sale in stores around Washington, and agents confiscated every copy they could find. They also attempted to obtain the names and addresses of those who had purchased copies of the map, and even went to New York to destroy Colton’s lithographic stone. As a result, these maps are very rare today.” The example in Waverly’s Nov. 21 auction, which was consigned by The Association of the Oldest Inhabitants of the District of Columbia, is estimated at $4,000-$6,000. The maps and atlases category, overall, is very strong. A circa-1794 edition from London with 87 plates is voluminously titled “A New Universal Atlas…A Modern History and Description of the Whole World Containing New, Full, Accurate, Authentic, and Interesting Accounts and Descriptions of Europe, Asia, Africa, and America.” Nineteenth-century atlases include “Kingdoms, States and Republics of the World (1854),” and “The Illustrated Atlas, And Modern History of the World – Geographical, Political, Commercial, and Statistical (1851).” Also, several high-quality lots were consigned by a major collector of early Bermuda maps, a specialty category that has a dedicated following. An item of great historical importance is an 1868 textbook on seamanship that was owned and signed by James Henry Conyers, the first African American cadet enrolled at the US Naval Academy in Annapolis, Maryland. Conyers was appointed to the academy by US Representative Robert Elliot of South Carolina. Unfortunately, Conyers’ tenure at Annapolis was brief. He suffered indignities and repeated beatings at the hands of racist midshipmen, and after a relatively short time, left the academy. The textbook is entered in the auction with a $3,000-$5,000 estimate. A small but remarkable archive of World War II memorabilia comes with provenance from Bruce Norton, the former director of the Marine Corps Command Museum in San Diego. One of the lots is a panel from a 1995 calendar commemorating the 50th anniversary of the US Marines’ landing at Iwo Jima. It is signed by approximately 66 Iwo Jima vets attending a 50-year reunion, as well as photographer Joe Rosenthal, who took the iconic 1945 photo of Marines raising the American Flag on Mount Suribachi. This item is estimated at $400-$600. A second item consigned by Norton is a 1953 book titled “Pearl Harbor to Golgotha,” written by Mitsuo Fuchida, the air captain who led the Japanese attack on Pearl Harbor. Fuchida, who later became a Christian minister, signed the book after being recognized by a Marine at a diner in Idaho. The book later came into Norton’s possession and now will be auctioned with a pre-sale estimate of $400-$600. Engraved portrait of Abraham Lincoln framed together with 1865 handwritten note in authorizing passage through Union lines toward Richmond. Est. $3,500-$4,500. Topping the Presidential selection, an engraved portrait of Abraham Lincoln is framed together with a handwritten note that reads: “Allow A. Van Camp to go through our lines to Richmond and to return upon his own private business. A. Lincoln. Feb. 25, 1865.” The estimate on this lot is $3,500-$4,500. The auction also includes documents signed by Presidents James Monroe and John Quincy Adams. An estimate of $4,000-$6,000 has been placed on the 10-volume set “The Complete Works of Edgar Allan Poe.” It is one of 26 editions that were published in 1902 by G.P. Putnam’s Sons. A century older and no less fascinating, the 1805 R. Shannon work “A Practical Treatise on Brewing, Distilling, and Rectification…” deals with the “genuine process” of making brandy, rum and Hollands gin, and the “London practice” of brewing porter, ale, and table beer and country ales. One of the volumes delves into the cultivation of wine grapes, wine importation and even wine tasting. Estimate: $600-$900. Waverly Rare Books’ Nov. 21 auction will begin at 6 p.m. Eastern time. The preview begins on Nov. 16 and continues through and including auction day (see website for hours). The gallery is closed on Sundays. 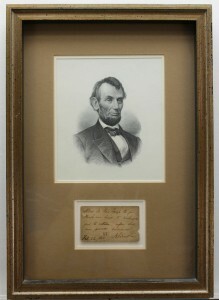 **All forms of bidding will be available, including absentee or live via the Internet through www.LiveAuctioneers.com. For information on any lot in the sale, call 703-532-5632 or e-mail monika.schiavo@quinnsauction.com. Visit Waverly Rare Books online at www.quinnsauction.com.